Big Toonie, Holy Beer, Chocolate and More - Travel, Shop, Cook, Have Fun! When you work full time, commute for three hours every day, you do not have much time left for anything else. Our weekends are packed lately with things we are not able to finish during weekdays. If before, a quiet weekend for us meant staying home, spending an evening sitting on the patio; now, just following our own slogan – “Travel, Shop, Cook, Have Fun!” means having a relaxing time. And then finding the time to write about all our adventures is not an easy task as well. Very often I create a post using my notes, pictures and pieces of information retrieved from my memory, which by that time got thoroughly covered with a thick layer of my emotions mixed with imagination. This is one of them. I wanted to write this post for a long time, but my body, extracted every day from the GO Train in a zombie-like state, was refusing to cooperate. Right now, it seems my brain got re-connected with reality again, so I have no time to waste. It was one of those weekends when we, finally, could do something we like. And this is when indecisiveness suddenly came upon us. Saturday morning, we woke up and had no answer to the infamous question, ‘What do we want to do today?’. It was hard to decide, do we want to go somewhere or stay home? Should we go far or not too far? Visit absolutely new places or places we already know and love? East or West? North or South? We wanted to get the most out of this rare opportunity of having time for ourselves and now we got stuck. Okay, we poured another cup of coffee. Sip… another sip.. much better. Finally, the decision was made – we are not staying home and the direction was chosen – East. And we decided to start from Warkworth. The weather was absolutely lovely and we had a very pleasant drive. In 1.5 hours we parked our car on Main Street in Warkworth. We visited the village of Warkworth a few times before. It is one of our favourite places to go. We love to slowly walk down Main Street, visiting local shops and boutiques, and talking to people. 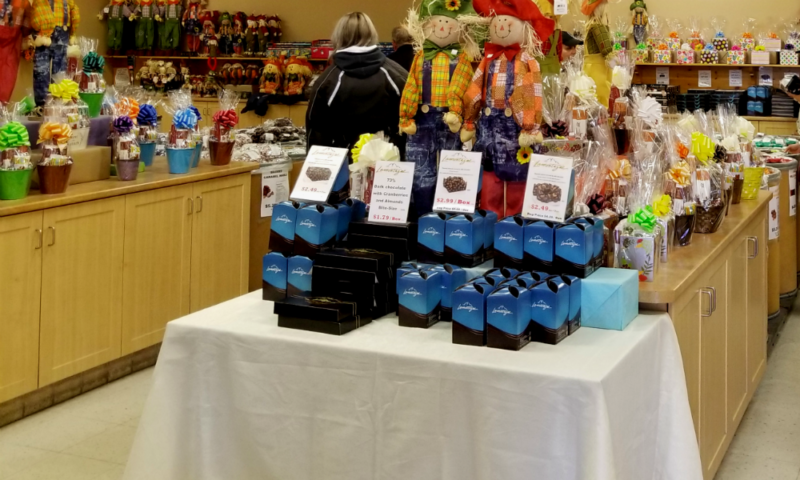 This time we decided to visit Centre & Main Chocolate Co.
You know, there is good chocolate and there is just chocolate. From the moment you enter Centre & Main Chocolate boutique, you understand that this is a good chocolate place. 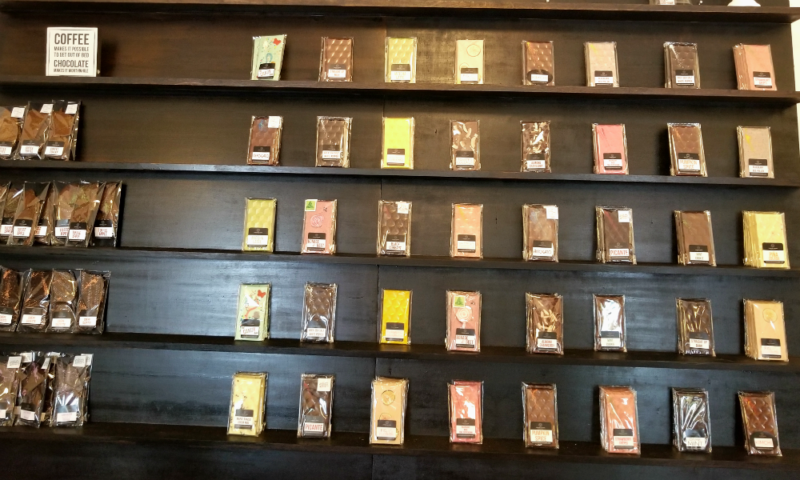 The store is nice, simple and elegant — beautifully designed chocolate products are proudly displayed. Unfortunately, that day, we didn’t get a chance to meet the chocolatier and discuss the unique flavours of her creations. For example, we wouldn’t mind knowing what inspired her to make kimchi or turmeric flavoured chocolate. And even though I’m not a big fan of extreme taste experiments, for some reason I couldn’t resist and decided to challenge myself. 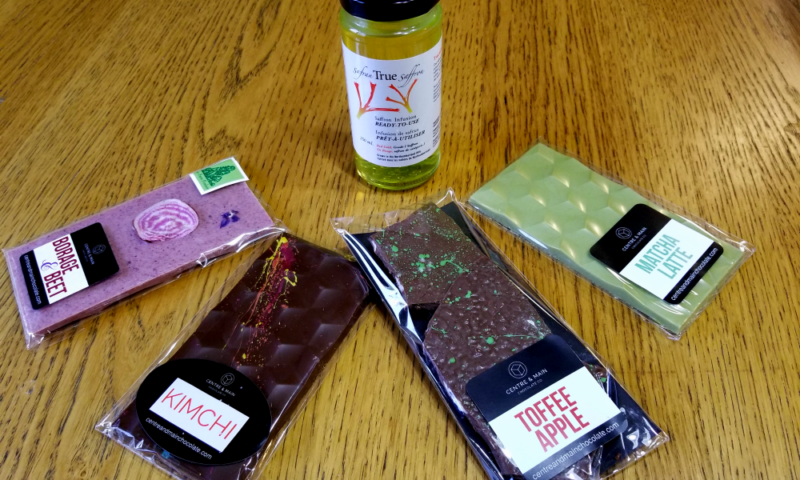 We bought a few samples of delicious chocolate to enjoy at home. 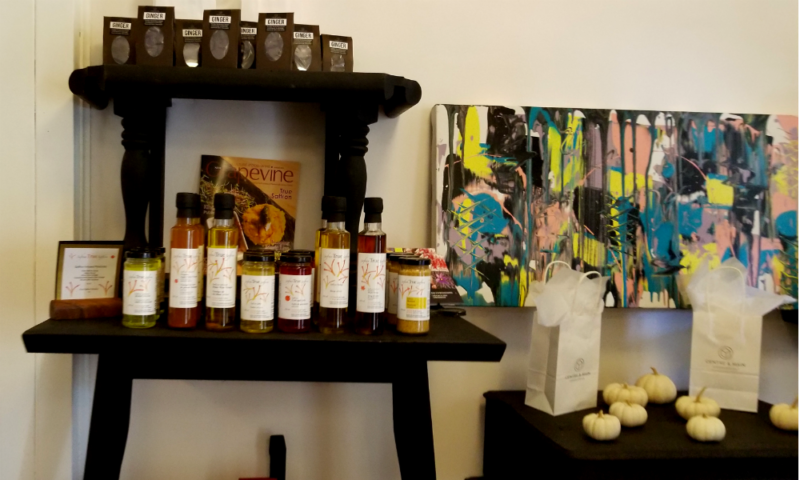 Also, the store carries products from other local producers like True Saffron, which produces the most expensive spice in the world locally. So we got saffron infused water for future kitchen adventures. 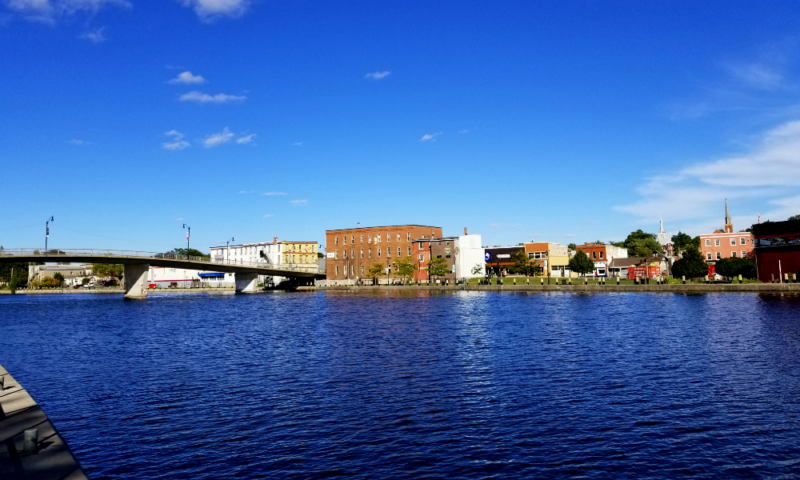 Campbellford, Big Toonie and Other Stuff. 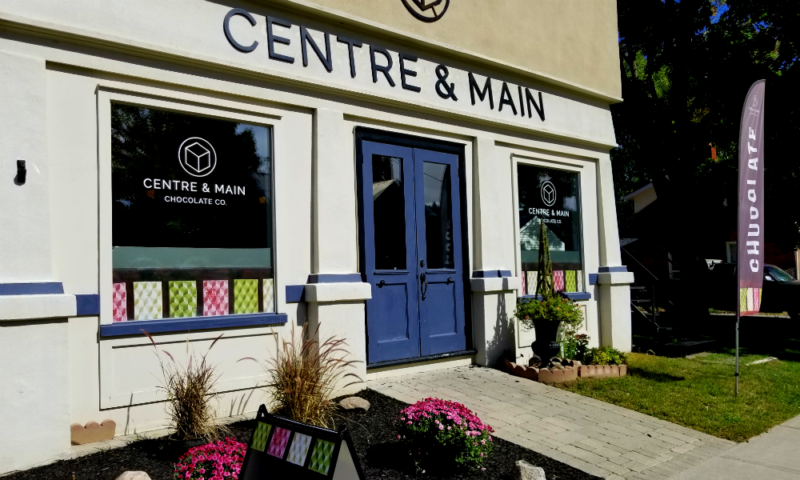 After successfully completing our shopping at Centre & Main Chocolate boutique, we rewarded ourselves with delicious ice cream from The Village Pantry. It was around noon and we still had enough time to go somewhere else. 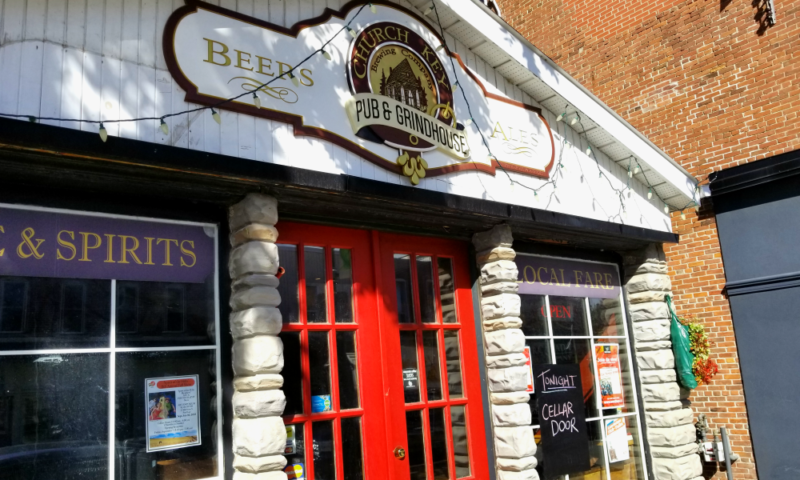 I was thinking to visit Campbellford for a while and now we decided that it was a very good idea. It took less than 20 minutes for us to get to there from Warkworth. 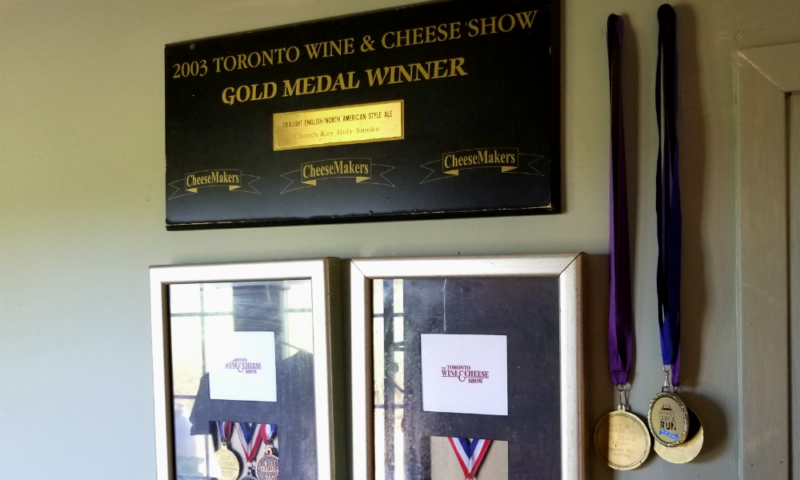 Before visiting this small town I knew that Empire Cheese factory and a chocolate factory (previously known as World’s Finest Chocolate Factory) are located there. 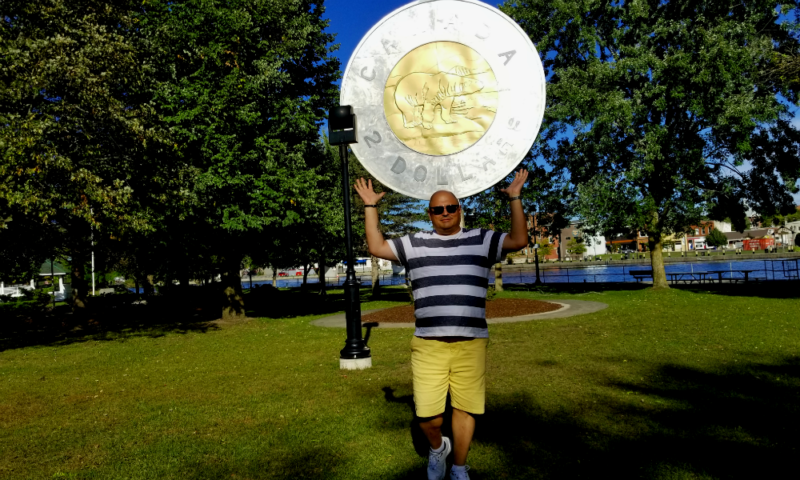 Upon our arrival, we’ve learnt that Campbellford also has the biggest toonie in the country. 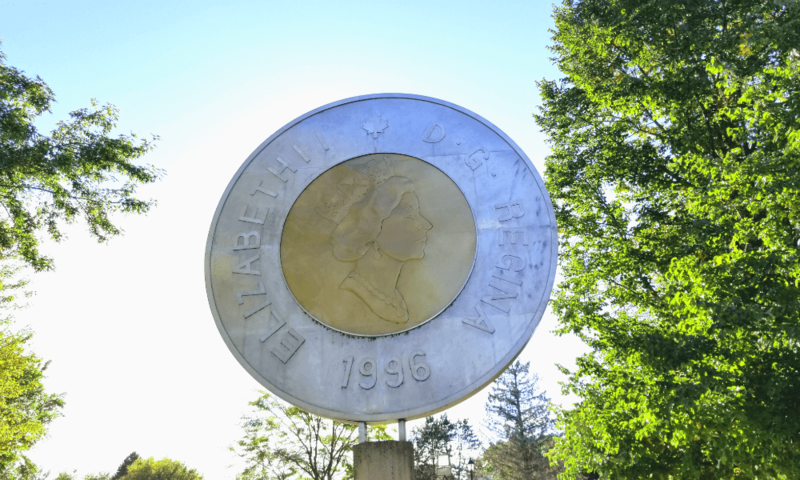 The Toonie Monument, which represents the giant two dollar coin, is located in Old Mill Park and was built in 2001 to recognize the efforts of a local artist who created the polar bear that was used on the coin. 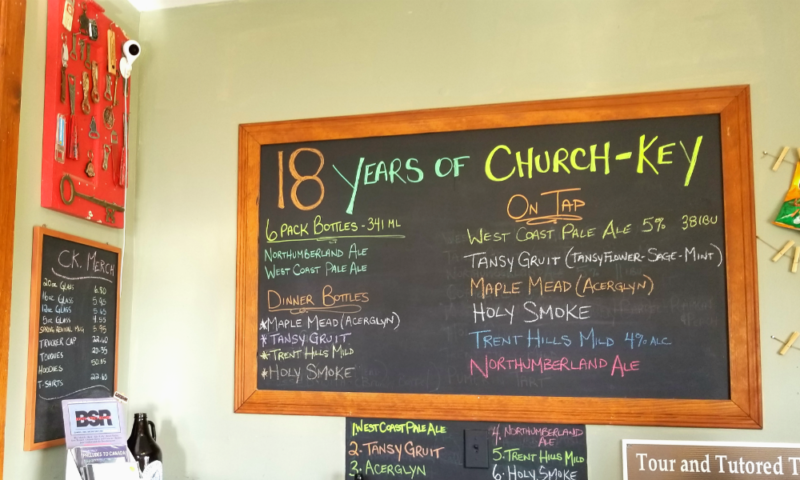 Another interesting fact we discovered – The Holy Beer is also produced there. 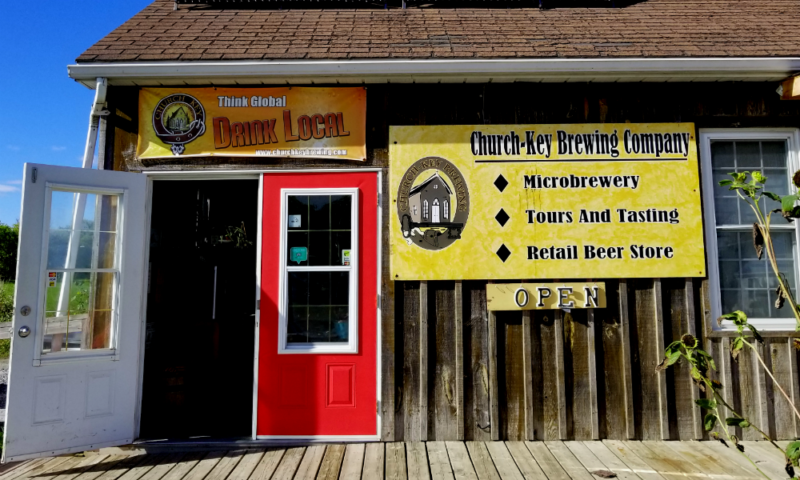 Church-Key Brewery is situated in an 1878 Methodist Church on the outskirts of Campbellford. 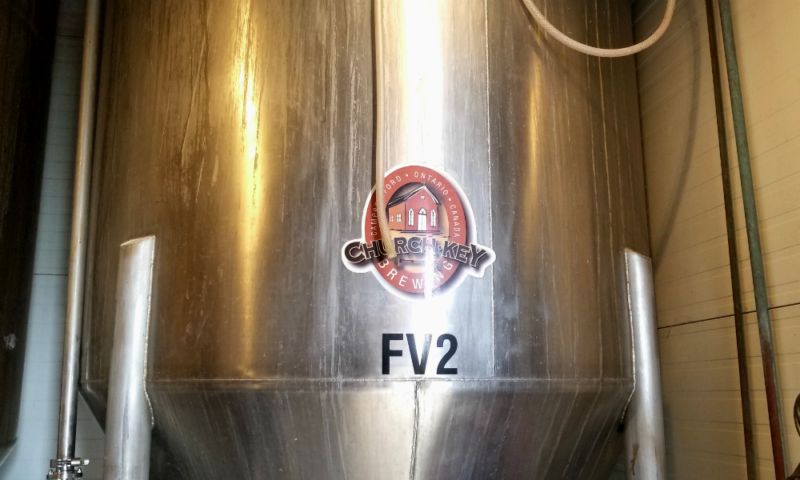 Founded in 2008, this was the first micro-brewery in Northumberland County. 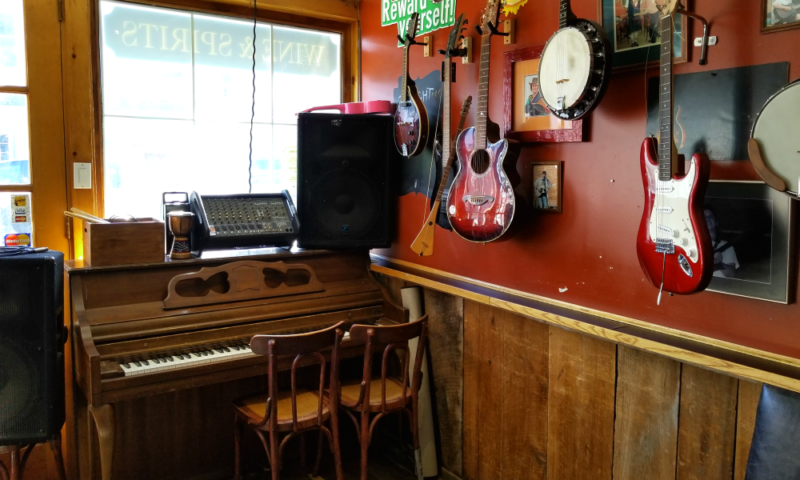 First, we visited The Church-Key Pub & Grindhouse — which means they also serve coffee. It was a very nice, cosy place and we enjoyed a cup of very good espresso there. Then we went to receive communion in the brewery, which is in the church. The visit was successful, we liked the beer and loaded a few holy samples into our car trunk. Food tourism became very popular lately. 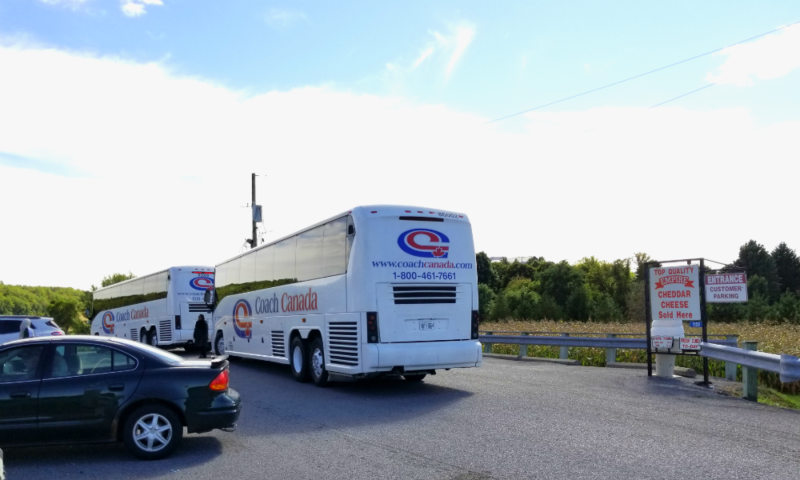 For wineries, for example, a huge parking lot is now a must-have to accommodate buses full of wine thirsty, picture-taking tourists. But where can non-drinking people go? I would think, visiting cheese or chocolate making facilities will be the best option. Instead of taking pictures next to the wine barrel, you can take a lovely picture of yourself hugging a pack of cheese next to the fridge. 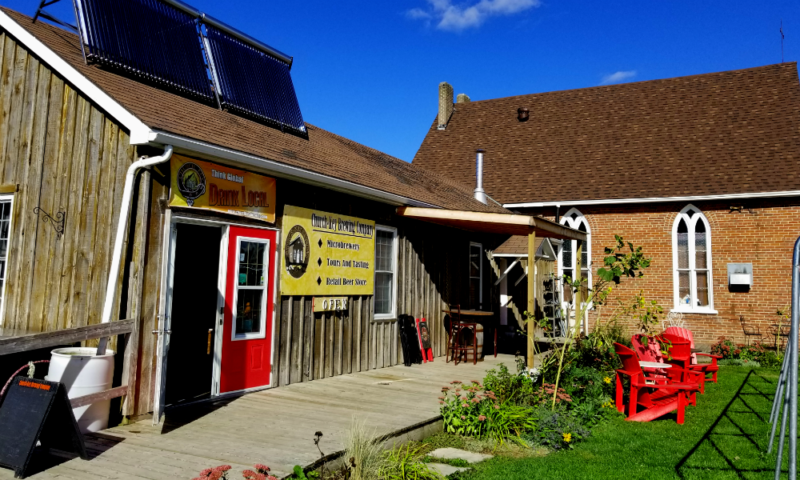 It so happened that Campbellford has both – a cheese and a chocolate factory. 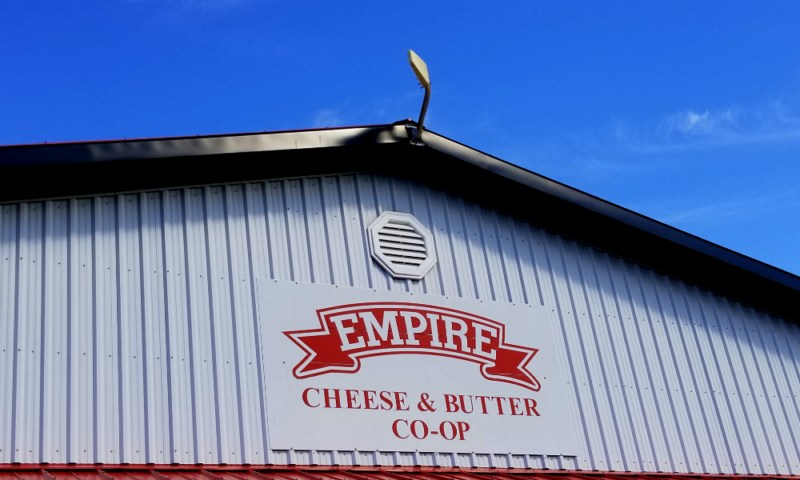 Before our arrival at Empire Cheese Factory, two buses of cheese lovers got unloaded at their store. As you can imagine, posing next to the fridge was no longer an option for us So we grabbed some cheese, hugged it in the car and headed to another destination – the chocolate factory. 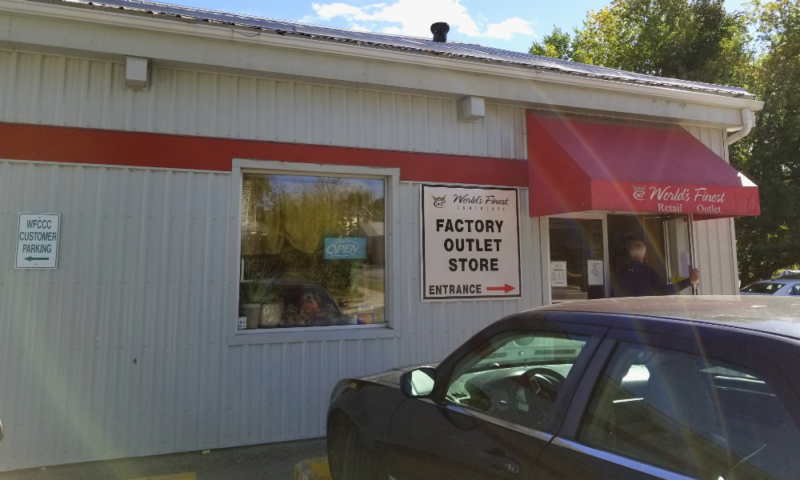 World’s Finest Chocolate Factory outlet store is definitely another popular place in Campbellford. The store was very busy. And no wonder – it’s full of chocolate! And it is cheap. 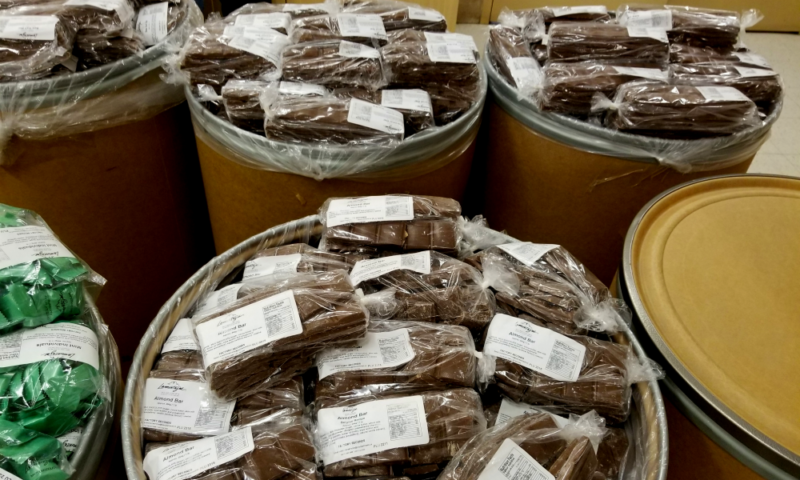 Chocolate bars of different sizes and different kinds; chocolate candies in bags; boxes and baskets; broken chocolate bars packaged in plastic bags. 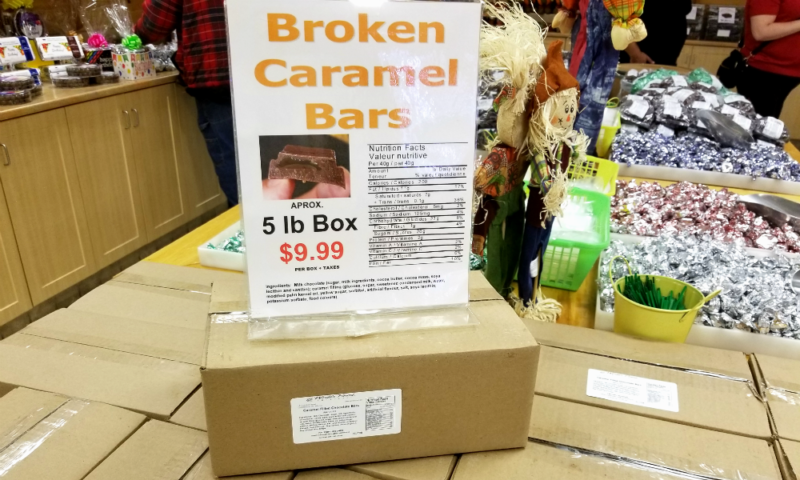 Where else you can get a 5 lb box of broken caramel bars for $9.99? This stuff is good for baking. Tourists could have gotten to this store any minute, so we had to think quickly. We bought a box of chocolate and peanut butter bears, and two bags of broken milk chocolate bars for baking. I swear to God, something was wrong with this chocolate – somehow it melted away so quickly. It was a wonderful trip. I’m very glad we didn’t stay home that day and I tried my best to re-create all the details of our journey. Hopefully, you enjoyed it as much as we did.